DOEWORKS Portable Walk-in Plant Greenhouse with PE Cover, 3 Tier 6 Shelf Garden House for Outdoor, 54.3"x 27.5"x 77.2"
The Doeworks walk-in greenhouse is designed to create the best environment for your plants to grow healthily, provide protection against rough weather conditions like rain, wind, and snow, and lets you exercise your green fingers in any place and any season. ☆ Greenhouse Cover: Weather resistant PE cover with roll up door gives you easy access to the Insides. 2 smooth zippers and 1 roll-up door for easy access! ☆ 4 ropes and 8 nails included, help to increase stability.It will not fall down even in strong winds weather. ☆ Durable and sturdy polyethylene (PE)cover for stronger, longer lasting life span. ☆ Heavy duty steel tube and mesh is durable enough to hold your pots, gardening tools and plants. ☆ Easy Assembly: no tools required, an assembly instruction sheet is included in the package for your reference. NOTICE: Please make sure all the tubes are installed in place with no gap. Constructed with 6 steel wired shelves - 3 on each side, and measures 54.3" L x 27.5" W x 77.2" H, which makes space for all your blooming flowers, sprouting plants and fresh vegetables. If you have any questions about this product by DOEWORKS, contact us by completing and submitting the form below. If you are looking for a specif part number, please include it with your message. 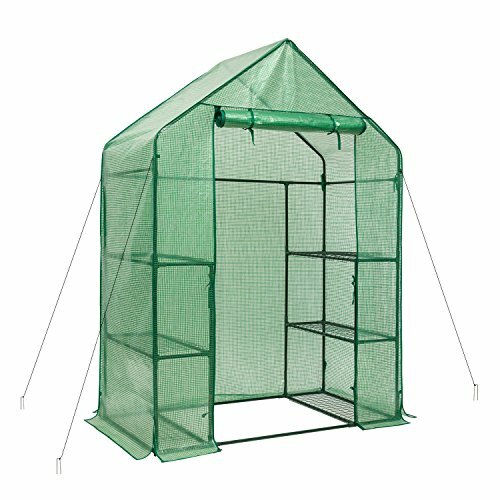 Quictent Mini Walk-in Greenhouse 4 tiers 6 Shelves Portable Small Green Grow Garden plant Plastic House 78"x56"x30"